Scabies is a skin disease of dogs caused by a mite, Sarcoptes scabiei. This mite is very small and cannot be seen with the naked eye. The scabies mite is HIGHLY contagious to other dogs. 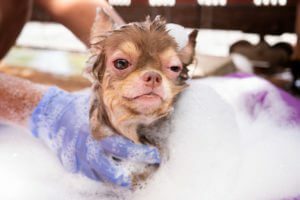 Dogs become infested with the mite by direct contact with another dog that has the disease or by using grooming instruments used on the infected dog. The mite burrows in the skin and makes the dog itch. The itching is VERY intense and may be worse at night. Red pimples, crusts and hair loss are seen, especially on the ears, elbows, hocks and chest as the disease progresses. The scabies mite can infest people and burrow into their skin. The burrowing of the mites causes little red bumps (rash). Sometimes if the pet has scabies, the owner is itchy, too. The itching and rash caused by this mite in people usually resolves when the pet is treated and cured. If you have symptoms, contact your physician. Scabies is diagnosed by scraping the affected areas and observing the mite in the scraped skin sample. The disease may be very difficult to diagnose because severe itching can be caused by only a few mites, and those mites can be very hard to find. Sometimes a dog has to be scraped 10-15 times before a single mite can be found. Mites are actually found in less than 50% of the dogs with scabies. Because of this, it is often necessary to treat dogs suspected of being infested with the mites even though mites cannot be found. If the pet’s itching stops after specific therapy for scabies, then we know the pet had scabies. (This use of medication is called a therapeutic trial). Scabies is treated by killing the mites with either a miticidal dip or oral medication. ALL ANIMALS IN CONTACT (which means in the household or visiting “friends”) should be treated.